Lowell Stambaugh thought there had to be a better way to steer a boat after his sank with 10 tons of fish aboard because its rudder stalled and wouldn&apos;t turn the boat to safety. "I sank the boat," Stambaugh explains. "It was fast and maneuverable, but it sank in 65-knot winds while fishing in the surf in Alaska. If I&apos;d had a little more maneuverability, I&apos;d have been out of there safely." 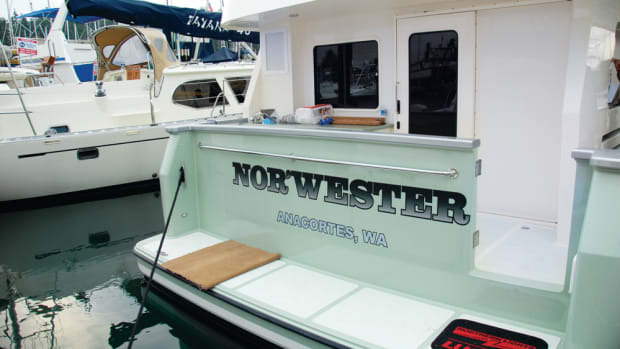 A veteran Alaska fisherman and builder of innovative and successful 32-foot Bristol Bay fishing boats, he thought a lot about why rudders work and don&apos;t work. What Stambaugh finally did was to look at the flaps on an airplane wing. Most of us watch the flaps work on commercial jets. Taking off, they extend and turn downward to increase lift. On a landing, they point to the sky to help put the plane on the ground. So he put a flap on a rudder and put it on a boat and went to sea. After a few miles, he knew he was onto something good/a rudder that was powerful, quick and always effective. Borrowing from the aircraft analogy, he called his design a high-lift Deflector Marine Rudder. A Stambaugh rudder is made of stainless steel and looks normal, except for the trailing edge or flap attached to the main body by a long, hefty hinge. There are some other mechanical connections, but the rudder flap works simply by itself without wires or hydraulic effort. As a rudder turns, the hinged, or articulated, edge turns progressively faster, creating a sharp angle with the main body of the rudder. This increases the kick power from water flowing past the propeller, and the boat turns quickly and easily. "The flap technology makes it much more powerful," Stambaugh tells me. "It&apos;s twice as powerful, or more, as a conventional rudder." The bearded fisherman works from his home on the Washington shore of the Columbia River, not far from the Megler Bridge and Astoria, Oregon (on the opposite shore). He builds his Deflector Marine Rudders there, and if you call, he&apos;ll overwhelm you with information. Stambaugh loves to talk rudders. Articulated rudders really are not new on the maritime scene. You&apos;ll find them on some tugs and other commercial boats that need good control and quick response in close-quarters work, but they are hard to find in recreational boating. Stambaugh has sold several of his Deflector Marine Rudders for use on new pleasure boats and tugs. One is on a 60-foot Ocean Havn, Alyeska, built on Vancouver Island in British Columbia. The second is attached to the keel of a Sockeye 45, a high-tech, retro-look yacht built by Sam Devlin on Eld Inlet near Olympia, Washington. Another is on Alice Louise, a 50-foot aluminum cruiser whose turning circle was reduced from 150 feet to 50 feet after a deflector rudder was installed, Stambaugh says. Now, however, Stambaugh faces a problem more difficult than designing a new rudder, and that&apos;s selling the thing. He&apos;s going to trade shows and hopes to begin advertising, but at the moment the industry is not flocking to his doorway on the Columbia River. Sam Devlin had been promoting the new rudder, and his new boat, for months. Finally, we got together in a boathouse in Shelton, Washington, for a trial run in the Sockeye 45 Edwin S. Dawson. 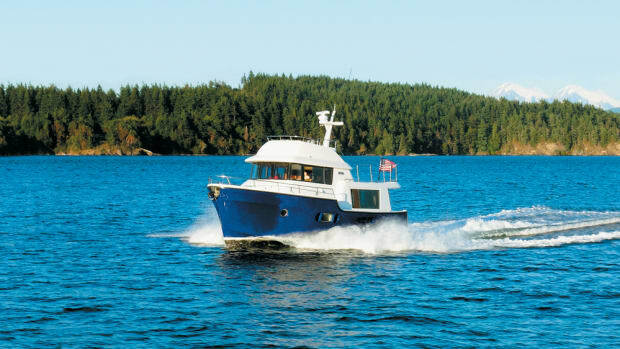 The Sockeye has the sturdy yet eye-appealing good looks of a boat built decades ago, with a raised pilothouse and a row of windows spanning the horizon. She&apos;s a double-ender, too. The yacht, however, is new in all ways. For more than 20 years, Devlin has pioneered the use of stitch-and-glue, cold-molded construction techniques to build a fleet of workboats and yachts from plywood and epoxy. After a quick tour of the boat, Devlin started the four-cylinder, 150hp John Deere and began backing out. He had little room to maneuver because a herd of harbor seals was hauled out on a bunch of floating logs little more than a boat length away from the boathouse. Devlin is a pro and had no trouble moving the bow around, using a bow thruster and the deflector rudder. We motored away from the dozing seals. Shelton is at the extreme southern end of Puget Sound on a long, winding waterway known as Hammersley Inlet. It looks smooth and inviting, but extensive shoaling offers only trouble for those without local knowledge. The shallow areas are shown on charts, but there are few aids to navigation, and experienced skippers have range markers/usually houses and docks/in mind as they head toward deep water. I&apos;ve never taken a boat into the inlet, and Devlin didn&apos;t offer the helm to me. It was time, then, for a detailed tour of the second Sockeye yacht built in the small Devlin shop. Was Devlin inspired by a fishing boat or by a tugboat? It could have been either, or both. As a child he won a prize for a drawing of a tug, and his bedroom was decorated with a workboat theme. As an adult he fished commercially and recently converted a fishing boat for personal use. Now he builds traditional-looking yachts and workboats in a shop on a picturesque cove. Sockeye 45s are full-displacement yachts of about 38,000 pounds. Construction begins with panels of half-inch plywood that are literally stitched together with baling wire. Devlin uses epoxy and fiberglass to strengthen and bond the joints, and then the wire is removed, leaving no trace. On the bottom, Devlin adds four layers of quarterinch ply/for a total thickness of 1.5 inches. The topsides get three extra layers of quarter-inch and a final thickness of 1.25 inches. They are glued together with epoxy, and the entire hull is given a finishing coat of two layers of Dynel, a fiberglass fabric strongly resistant to abrasion. In the boathouse, the walkway stood above the yacht, and it was a long step down to the purpleheart caprail and the cockpit, but a folding stool made it easier. The cockpit is not large, but a storage locker built across the pointy end of the boat provides good space for deck gear, buckets, parts and other essential boating stuff. There are seats on each side of the saloon entry door, with a life raft stored in one and a cooler in the other by the boat&apos;s owner, Dan Evangelista of West Palm Beach, Florida. Evangelista and his family spent the summer of 2003 exploring Northwest waters. In 2004, his goal is southeast Alaska. Devlin&apos;s first Sockeye, John D. Bosler, was 41 feet long. The extra length given the second Sockeye was divided proportionately between the saloon, pilothouse and stateroom forward, and the differences are subtle. Edwin S. Dawson (named to honor Evangelista&apos;s father-in-law) features a dining table flanked by leather-covered bench seats on the port side. It&apos;s about 7 feet long and converts to a bed. A small day head is in the starboard corner of the saloon; Evangelista also uses it to store rubber boots and some foul-weather gear. The galley is large enough to keep a couple of cooks happy. On the starboard side is a counter and sink, with storage spaces and under-the-counter refrigerator and freezer. This is where most meals will be prepared. You&apos;ll not find plastic laminate, granite or manmade stone counters on a Devlin boat. His countertops are solid mahogany and look too much like fine furniture to even consider putting a pot down. On Dawson the sole is mahogany, as are much of the trim and paneling, complemented by generous use of white Awlgrip. Devlin uses Port Orford cedar in finely crafted galley drawers and some paneling, and the aroma of that wood is spicy sweet. The stove and additional counter area are forward of the settee on the port side. At first, the divided galley seems unusual. But its utility soon becomes apparent. There is generous space for two, maybe three, to work on a meal without bumping. The galley counter on the port side would work for breakfast for two, or for a buffet for a crowd. Although Dawson has a reverse-cycle heating and cooling system, she also has small, bulkheadmounted Dickinson oil-burning heaters in the galley and stateroom. Most of the time, Devlin says, they provide all the heat that&apos;s needed. By now we were in the deeper, hazard-free waters of Pickering Passage, and Devlin gave up the helm. I settled into the Stidd helm chair and quickly discovered as we motored north that Dawson requires almost no effort to steer in a straight line. Later, Stambaugh said: "The rudder is quicker and more powerful and helps hold a boat on track more effectively." Along the west shore of Hartstene Island, Devlin suggested pulling into Jarrell&apos;s Cove, site of a private marina and a state marine park, for a close-quarters exercise. It was apparent, as the boat swung right, that the deflector rudder produces a turn faster and with less effort. I stopped the boat between the park and marina, along a line of mooring buoys that are filled with boats in season. Our visit was in the fall, and the state facility was nearly empty. Backing, Dawson showed less of a tendency to walk to the right, which is expected on single-engine boats, a trait Devlin also noted. Stambaugh&apos;s rudder apparently makes a boat track better, no matter its direction. With only a little pressure on the helm, however, the stern of the 45-footer swung quickly to the right. It was easy to spin her, in what seemed to be her own length. In our later interview, Stambaugh said: "If a boat turns in a 100-foot circle, I can turn it in 50. If it turns in 50 feet, I can make it spin." Owner Dan Evangelista has owned both sail and powerboats and agrees with Stambaugh&apos;s assessment. The articulated rudder, he says, "is fascinating. It makes a world of difference in maneuvering. She will turn in her own length, and that is very sweet." Devlin recommended use of the Stambaugh rudder. Evangelista&apos;s son, who also uses the boat, seconded the recommendation. "It is not high-tech; it has a simple feeling," Evangelista says, adding that the rudder is "psychologically reassuring," especially while making the tight turn into the narrow entry of his boathouse. "I am very pleased." At the north end of Hartstene, the passage was littered with floating logs and other forest debris. On my boat and on others I have operated, a quarter- or half-turn of the wheel is necessary to quickly move the bow and skirt trash just ahead in the water. With Dawson, it seemed that only a slight increase in finger pressure was adequate. The rudder action is not dramatic, like a kick in the pants. Instead, it is just there, working quickly, quietly and with little effort. The best part is that the helmsman doesn&apos;t have to ask it to work; there are no switches to click, no valves to open, no buttons to push. It just works. We turned the north end of the island and motored south in Case Inlet at about 8.5 knots. Dawson has an integrated Furuno electronics package, with three monitors directly ahead of the helm. We were watching a chart plotter on the one to the left, the depth sounder in the center and radar to the right. However, any screen can display any of the other functions, and three GPS receivers guarantee reliability. I looked longingly at the leather-covered watch berth on the port side of the pilothouse, but it was time for more exploration-not napping. A stairway on the right side of the helm leads down to the master stateroom, head and engine room. The boat was designed for a couple, so there is no door on the stateroom. A queen-size walkaround bed is in the bow, with hanging lockers and storage areas. The head is another Devlin hallmark: It has a teak grid on the sole, and the walls and countertop are painted with the same Awlgrip he used throughout the interior of the boat. A door in the head opens into the engine room, which is a tight little space, making daily checks easy. For more serious access, the back wall of the hanging locker may be removed to expose the engine room. Another Devlin tradition is the use of significant amounts of acoustical insulation around the engine space. With the John Deere turning 1800 rpm, the noise level in the pilothouse above measures 62 decibels. At 1700 rpm, the reading is 59. Your neighborhood library probably is noisier. In many production boats that have the pilothouse above the engine room, cruising speed generates noise levels in the mid- to high 70s, which makes normal conversation difficult and proves, over a long trip, to be physically exhausting. I exited the starboard pilothouse door to check the foredeck, the anchor well and lifelines and their sculptured stainless steel stanchions. Most impressive, though, was the beautifully finished purpleheart caprail. "How many coats of varnish?" I ask. "That&apos;s Cetol," Devlin responds, and the varnish snob in me gasps a little. Cetol, usually orange-hued on application to teak, looks great on purpleheart. Is it the wood, or is it the Cetol? So far, Stambaugh&apos;s deflector rudders have been installed only on new, single-engine boats, although they can be fitted onto older boats. They work with either hydraulic or mechanical (cable) steering systems. With hydraulic steering, larger rams are required to provide additional energy to turn the rudder quickly. There was no rough water in south Puget Sound on our demonstration run. Stambaugh, however, praises the rudder&apos;s performance when seas are up. "A trawler in following seas can slew around. If you do not react quickly, you&apos;re screwed. You want fast and powerful steering, so the autopilot can flick the rudder and pull you back on course. "This rudder does the task," he adds. Illustrations accompanying this article show clearly how the turning mechanism works. Its function is simple in operation, but difficult to describe. The articulating rudder may not represent high technology, but a lot of engineering consideration went into Stambaugh&apos;s design and development work. Both aircraft and boats will stall under certain conditions. In an aircraft, a stall may be fatal. On a boat, it may only be a momentary loss of steering power under certain angles of attack. Foil-shaped rudders often are used to improve performance. Stambaugh says the best rudder would be a plastic shape that would assume different curves on each side and vary in section. "We will not be having the theoretical ideal because of its complexity," he adds. "If it were more complicated, it wouldn&apos;t be suitable for boats." One of the major benefits of the Deflector Marine Rudder is its ability to delay stall, he says. Many manual marine rudders will swing only 30 to 35 degrees, with stalling a possibility between 12 and 20 degrees, Stambaugh explains. "We recommend a full 90 degrees of total tiller arc," Stambaugh writes in a paper explaining his concepts. "At the hard-over position of 45 degrees, the flap of our western style Deflector Marine Rudder articulates 36 degrees more. The flap gives an incremental deflection, creating a vector in excess of 80 degrees to the fore-and-aft axis of the vessel." Twin-engine boats usually have small spade rudders that are ineffective on trawler-type yachts in following seas. Stambaugh is working on a design for deflector rudders that will replace spades. He&apos;s planning to make then from UHMW (ultra high molecular weight) plastic, a manmade material he describes as unbreakable. A Deflector Marine Rudder will cost at least $2,500, Stambaugh says. The one he built for Dawson cost $7,000, or less than 1 percent of the boat&apos;s $800,000-plus price. "The cost is minimal in the total picture," he adds. "One guy said he thought he had paid too much (for a rudder) but then said it performed twice as good as he expected." The Sockeye 45 showed her sea-keeping qualities last summer when she was caught in an enormous tidal rip that often forms near Point Wilson, where Admiralty Inlet meets the Strait of Juan de Fuca. A condition apparently caused by certain tidal conditions and winds, the rips can generate seas of 10 or 12 feet. Dawson was hammered by the rip, and she rolled and pitched. Galley drawers flew open and across the sole. A falling object slammed the mahogany sole in the pilothouse, leaving a dent. Even the sturdy Stidd chair suffered upholstery damage as the boat was challenged by the steep, closely spaced seas. The crew held on as waves smashed onto and drenched Dawson. Finally, she broke through the rip into calmer waters, her crew both relieved that the worst was over and impressed by the yacht&apos;s doughty performance and the way she was built. Dawson was the only project in Devlin&apos;s small shop for 15 months, where his crew put in 13,000 hours of labor building her. The people who work for Devlin are carpenters, mechanics and electricians by trade. In truth, they are artisans who do wonderful things with wood while creating an obviously stout seagoing vessel. Our day at sea was calm and peaceful. Southern Puget Sound in the fall is a great place for cruising, but we saw only a few other boats under way. Appropriately concerned for Dawson&apos;s welfare, Devlin took the dark-hulled yacht carefully through the dangerous shoals of Hammersley Inlet, pulled a quick left turn and eased her into the boathouse. The seals still were snoozing on the logs, the only ones unimpressed by Edwin S. Dawson that day.